By the time you read these words, Hurricane Irma will have put her stamp on my home state of Florida. We are currently preparing for the worst while hoping and praying for the best. I thought it might be fun to put myself to a test. I talk with my coaching clients all the time about the leadership skill of self-awareness. So here are some things I noticed about myself as we prepare for this monster storm. Our first experience with one of these spinning giants was last year. Matthew went whirling past and the winds were about 80mph, but the storm stayed far enough off the east coast of Florida that in Orlando, where we live, property damage was minimal. Since so much devastation was predicted, and we only lost power for an hour or two, my thoughts were completely biased with bad information. Even as I saw the destruction of Harvey on the news, my thought was we won’t ever see a storm like that. My thoughts have changed. As I write this post, I am realizing how faulty my thinking actually has been. Only God knows what Irma will bring with her or even where she will go, as I write to you on this Thursday morning, about 3 days prior to the storm's impact. I will be honest with you, I really didn’t think much about this storm until yesterday (Wednesday) when I got a text from my brother asking if we were prepared and what our plans are for the storm. We were in the middle of enjoying a relaxing Labor Day weekend with our boys in Columbus Ohio and spending quality time with our granddaughter. In that moment, I turned to my wife, Kim and said, “Did you know there was a storm coming?” Up until this point, I was completely unaware that Irma was even in existence. How could I have possibly missed news of this magnitude? I knew that my granddaughter was cute, but I had no idea that enjoying my time with her so much had disconnected me from the rest of the world. By definition, it is incredibly difficult to know something that you are not aware of. Most of us just cruise through our day focused on our own agenda and the tasks that we have to complete that day. We just don’t take the time to see how we are showing up when we go about doing what we do. In order to be more self-aware of what is going on around you, it is imperative that you stop what you are doing and observe how you are doing it. When you are in a meeting with someone and they are not doing what you want them to do. Take notice of how you are talking to them. What is the tone of your voice like? Can you feel the emotion and then describe the feeling? The more aware of how you are showing up, the more control you will have over the choices you can make in how you show up. 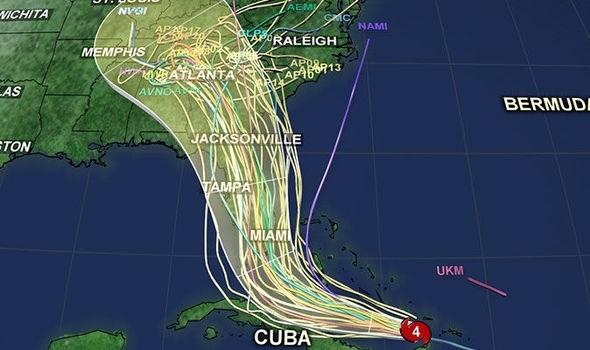 So my wife Kim pulls up the weather app on her iPad and sure enough, there is a Category 5 Hurricane in the Atlantic and all of the spaghetti maps show that Florida is in the bulls-eye of the storm. "What do you think we should do?” Kim asked. When Kim asked the question, I had no idea what we should do…but I felt like she was looking to me for an answer. She needed some reassurance from me that I had an idea of what would be best for us as this crisis came upon us. While I actually didn’t know what to do, my knee jerk reaction was to do something. My wife was looking for me to answer her safety and security needs. At that particular time, she had me in a position of large-and-in-charge. The feeling can be overwhelming and dangerous. In the moment it didn’t really matter to me what I said, I just felt like I needed to say something in response to her, like she needed some definitive expert knowledge from me on how to predict what a category 5 hurricane was going to do and how I should respond to it five days in advance of the event. I had this overwhelming feeling of power come over me and that a decision was needed from me at the moment. Very strange! So we made a list of options. Action steps that could be taken some 5 days ahead of the crisis. I think the most important thing about creating options is to make sure you are using what is called divergent thinking. Most of us like to think in a convergent style: our preference is to focus in on a solution of what needs to be done at the moment. Leaders who are self-aware can resist being seen as the “all knowing” and practice thinking in a divergent manner. These leaders can start with the problem instead of focusing on what they see as the solution. If you start by focusing on the problem, then you can create options on how to solve the problem. If you focus on the solution, you might miss the core of the problem that you are solving. Stay home and ride the storm out. As we discussed the pros and cons of each of our options I tried to maintain focus on staying calm. In the emotional intelligence courses I teach, we make a big point about how stimulated emotion can affect the decisions we make. While all of the options we had were viable, the decision became clear as we calmly talked through what we needed to do. It was very easy to let anxiety creep into the moment and over the course of our discussion I could palpably feel the tension. Then I would take a deep breath, stand up and walk around and try to get curious about our discussion. What I have noticed over the years is that anxiety wants to rush me into the decision, but I know I make the best decisions when I am calm and have a level head to think. We decided to keep our current plans, and are at the moment 25,000 feet in the air somewhere over the state of Florida. We are going to ride this storm out. Our desire was to be there for our friends and neighbors and if we can lend a hand to those who need we want to do that. I will try and give you an update this week on what we learned about category 5 hurricanes. Some of you are reading this and might have made a different decision. In fact, the police officer at the Columbus airport we were talking with before going through security encouraged us to evacuate. He gave us some solid reasons, but we have our reasons to stay and they are solid reasons. In leadership, I think it is important to be open to learning. Many of you get paid to make judgments and decisions and I really value this as part of your role. As a leader, people are looking to you for insight and wisdom to run your business. Leadership is also about learning. Rarely are two situations or contexts are ever the same. So many variables go into good decision-making. My hope is that you will pay attention, stay humble, create options, stay calm, and learn as you go. See you on the other side of Irma. Are You Interviewing for This Critical Attribute?